I didn’t wear a watch at all from about 2002 until 2015. Watches seemed to be an affectation of the wealthy, who could lay out thousands, or tens of thousands, for a chronograph. If I needed the time, that’s what my cellphone was for, or there’s clocks just about everywhere now. The original Apple Watch (later given the moniker Series 0, or S0) changed my opinion about what watches were for: they’re not limited to the time, they’re capable of being a polite tether to everything else you’re needed for. When I added the S0 to my daily wear, I ended up naming it Bates, from the Julian Fellows drama Downton Abbey. John Bates was the Earl’s valet, there to remind him who he was meeting with, handle his schedule, and keep him on-time and looking sharp. Not the major domo of the house, or the butler, but rather someone with limited responsibilities. That’s my watch. It could tell me when I was supposed to be somewhere, it could tell me about who’s calling, and really, that was about it. The Series 2 (S2) that followed on two years later was a substantial improvement, it could run apps, for one, or at least it did on occasion, when it felt like it. The S2 was still largely limited to basic duty: texts, timers, the occasional phone call (but only close by the phone) and telling me if I was getting up and moving enough. I liked the Nike version’s different face, but it wasn’t any more expensive than the standard S2, but their sport bands are the best of the bunch. Most of the time, I ended up wearing the sport loop with hook and loop closure for comfort and breathability. I was a pretty happy wearer! I wasn’t interested in an upgrade! When the S3 came out, the cellular functionality seemed of limited usefulness, and so I didn’t run for the update. But then came the Series 4. Fall detection. Better heart rate monitoring. An on-board ECG. This June, while I was in Vancouver for MacDevOps, I woke up one morning with chest pain. There’s no online medical documentation for chest pain that doesn’t also say “SUMMON THE MEDICAL PERSONNEL AT ONCE. YOU ARE PROBABLY DYING.” So I got a cab to the emergency room nearest my hotel and experienced the Canadian Medical System. Blood tests were indicative that I was fine and that it wasn’t cardiac problems presenting itself. I knew it probably wasn’t when I went. But do you take that kind of risk when you’re thousands of miles from home? Sadly, that adventure cost me about $1,000. If I’d been here in DC, $75 copay for an urgent care, but traveling far? Alas, I’m out a bunch of money. If I’d had a way I could’ve done some basic diagnosis, I might’ve let it wait til I was home in DC before I sought assistance. Turns out it was a strain of an intercostal muscle between my ribs right at the sternum where my shoulder bag rode. I’ve switched back to backpacks, and all has been well since then. 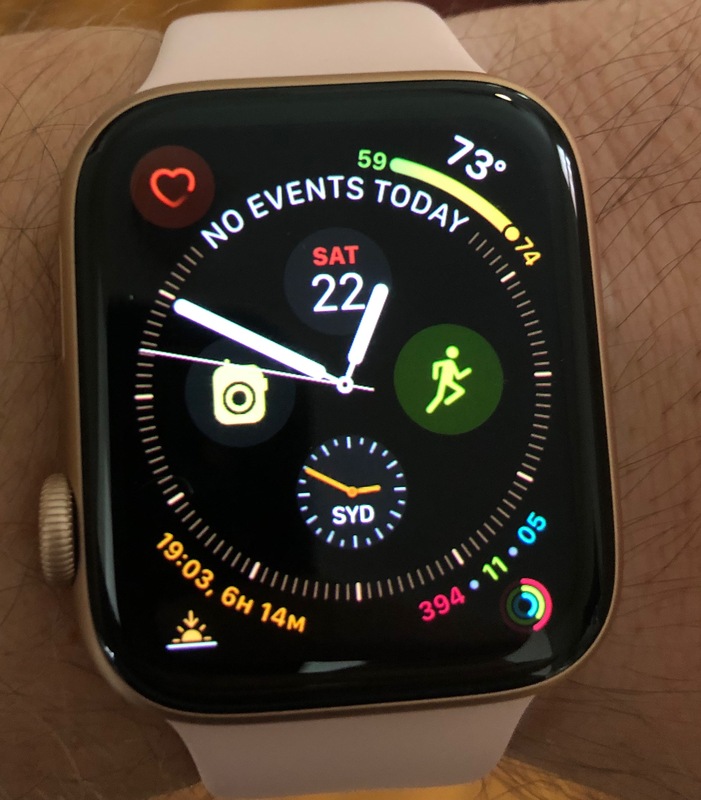 More than just the health feature, the larger 44mm display supports a new more information-dense display, and the Infograph face as displayed above is the right level of information overload for me. Having to cherry pick one or two complications was difficult, but now I have eight slots to choose from, plus a calendar line item. It’s exactly the right level of ambient and purposed information. The physical wearing of the watch is also a major upgrade. The thinner but taller case is absolutely welcome. I was afraid of having an aircraft carrier on my wrist, but this is the right level of size. The brighter OLED screen is impossible to miss, and I feel as if the new more sensitive gyroscope makes the raise to wake function much more accurate. In addition, the new S4 system-in-a-chip is finally, finally fast enough to run applications on the watch itself. Though the number of applications I want to run on my wrist is small, Overcast for podcasts paired with my AirPods is a dream come true. I can leave my phone at home instead of carrying it with me. I did sign up for the cellular model, and I will say that the setup of the number mirroring was flawlessly easy. The setup of the watch as a whole was spectacularly easy. I had given myself an hour’s time to get the watch picked up and paid for, and then setup. I needed all of 40 minutes. That included the wait to pick up my equipment, unboxing, and restore from my backup, and setup of the cellular line. I was in and out of the Apple Store well before I’d laid eyes on the gold stainless model I just couldn’t justify the extra $200 for, and didn’t want to regret seeing in person! From there, it was a drive from Arlington to Ellicott City, done with Apple Maps giving me queues on my wrist, letting me feel the new Taptic Engine. It’s an improvement over the S2, which either felt like too much, or you couldn’t feel at all. An hour or so later in traffic, I’m to my meeting. Phone in the pocket, and in I go. I received a couple calls – sent to voicemail – and a few texts, which got trivial replies from my wrist. Meeting concluded, it was back in the car and back into directions mode. I ended up at IKEA to review some cabinetry. As IKEA is best taken at a brisk walk, I figured I’d see if I could trigger the workout detection. Turns out I’d need to have walked faster. I blame the crowding. Anyway, it was adept at capturing it as “exercise” just not “workout.” Off to the house. This time I took a call on my wrist, and wow was the speaker a major improvement. Not something I want to do more often, but something that’ll let me leave my phone wherever. It’s 5pm, and I’ve told a friend I’ll meet them at Nationals Park at 6, so I pack up and pick a bikeshare bike from our rack at the corner, and setup a workout. 33 minutes of good biking later, I’m docking down at the ballpark. It wasn’t fast riding – the bikeshare bikes are heavy and not built for speed! – but it was a good test of the battery effects of a “normal” workout. I swipe up into control center. It’s 5:50pm, and I’m still at 45%. Rock on. The Nationals do their best to show their 3rd place position, but come up short against the Metropolitans. I use Apple Pay at the concessions to buy dinner, and then a soda later on. After the game, it’s home via the Metro with a friend, and another short ride home on Bikeshare. At 11:30, I put my watch back on the charger at 30%. Not bad. Overall, the Series 4 Apple Watch represents a huge refinement of Apple’s vision for the future. I am still becoming comfortable with the idea of leaving my phone at home when out on a ride or out for a long walk. I will get there, but I’m not there yet. Count me in love with the Series 4 in a way I never was with the Series 2 or Series 0.